Horses of Hope Oregon is a service organization. Our goal is to improve the quality of life of our clients. We depend on you, our volunteers for everything from side walkers, to grooming and tacking the horses, to helping with fundraising and horse conditioning. The opportunities are limitless. We seek to match opportunities with interests and individual schedules! Our volunteers are the driving force behind our organization, and dedicate thousands of hours annually to help our clients achieve their goals. Volunteers come from all walks of life, and many have no horse experience. No special expertise is required – just a passion to help make a difference in someone’s life. 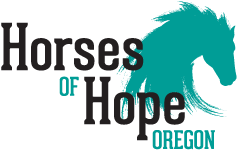 Learn about all the great opportunities to volunteer at Horses of Hope Oregon, and sign up for the next volunteer orientation.